Growing: Easy Jack Plant is a strain that belongs to the selection of Jack Herer. It is mostly sativa with a slight mix of indica strain. It is a marijuana variation with a playful sweet flavour and a shorter flowering time which is a result of the Indica trait. 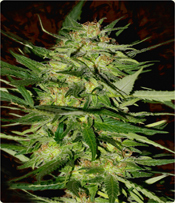 It comes from Advanced Seeds and is highly recommended when you are looking for a strain that requires short flowering period and at the same time is very potent and still be able to produce an energizing sativa kind of high. Know that Jack plant is mildew resistant which makes it easier for growers to cultivate the plant outdoors. Know that when you grow Jack plant outdoors, the height of it may reach up to 5 meters and can give high amount of yields. The yields for Jack plant may differ slightly depending whether it is grown indoors or outdoors. Sort flowering period, high THC level and high amount yield, Jack plant certainly is one of the best seeds Advanced Seeds has to offer.